Tempura restaurant which is quite expensive at night, but at lunch time, other than the tempura set(tempura and rice come separately) and tempura full courses with prices ranging from 5000yen to 7000yen, a more purse-friendly option of 2100yen kakiage-tendon(very delicious) is also available. The content of the tendon changes with seasons – when we went there were asparagus, soramame, small prawn, scallop etc. in it. The chef used to work in the famous tempura restaurant in Yamonoue hotel which I have tried before and is a big fan. Reservation at lunch is only possible if you order the more expensive set/course. I went without reservation on a weekday, arriving at around 12:30pm and it wasn’t so full. But while we were eating people kept coming in and just before 13pm, the place was packed. 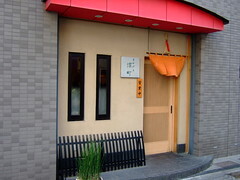 It is a small restaurant with mainly counter seats but there are also two tables for two. 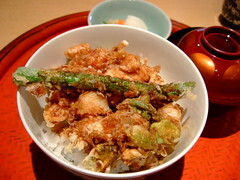 This entry was posted in 03:Japanese, 05:銀座・新橋・日本橋, Favourite Food Entries and tagged tendon by seat. Bookmark the permalink. Have you tried other places such as Kondo and Ten-ichi? How does this place compare?? I have never been to Kondo – should like to try it someday. Haven’t been to Ginza Ten-ichi honten in Sony building either, but have had lunch at the Imperial Hotel branch. The 4000yen lunch course was tasty enough but nothing really impressive. I’d like to try the tempura course at Fukamachi too. How come the Brussell kanda entry’s comments are closed? Another good recommendation!! I tried this place 3 days ago, and it was my first “expensive” tempura restaurant. For dinner, they have menus starting from 10500 yen. That cheapest menu includes a selection of tempura (2 shrimps, 4 fish, 4 vegetables), a tendon (tempura on rice) and a soup, as well as a dessert. It might look a little small, but it is really filling! The quality of the tempura was obviously high, they use only sesame oil which is changed every three customers. All dishes are prepared behind the counter, and sitting there is recommended (there are anyway only 2 small tables). Wow you went there for dinner! I would definitely want to try their tempura course someday. I didn’t know that they change the oil every 3 customers. That is exactly the difference between expensive and cheap tempura places other than taste – trans fat content!! Yes, indeed they change it after about 45 pieces were fried in it, which corresponds to about 3 customers! When you look at the oil, you realize that it is always so clear… and this, indeed, makes the difference. And I just came from Aux Delices the Hongo, an address that was recommended here, too! A very good French restaurant, with large servings! I am glad you like Aux Delices! I have been there many times but I always go with a loyal customer of that restaurant, which might enhanced the dining experience somewhat(both food and service). So I am glad to hear positive reviews from other people. I guess translating the menu to English is difficult, especially the menu is changing all the time.